You should never ignore your monthly statement. Whether you’ve just opened your first bank account or you’ve had one for years, understanding your bank statement is an important part of managing your finances. Bank statements can be confusing, and many people ignore them, but if you learn how to read your statement you can catch things that might slip right past your wallet such as fraudulent charges, managing your spending, disputing fees and more. Whatever you do, don’t ignore your bank statement. A bank statement is a document you receive every month from your bank — or have access to online — that enables you to track all your account activity for the past month. Generally, bank statements contain information from the previous 30 business days. If you have a checking, money market or savings account, your bank should be sending you bank statements, either by mail or online, automatically. If you’re not receiving a regular bank statement, it’s important you do. Follow these steps to find out how to start getting your bank statement, and then make sure you review your bank statement thoroughly. Gather your personal and account information: Your bank won’t give you access to your account without proof that you’re the account holder. Make sure you know your account number and have an acceptable form of personal identification like a driver’s license, U.S. military ID or current passport. Visit your local branch: Your teller can make changes to your deposit account, including designating where to mail your regular bank account statement. They might also be able to print your current or past statements for you while you wait. 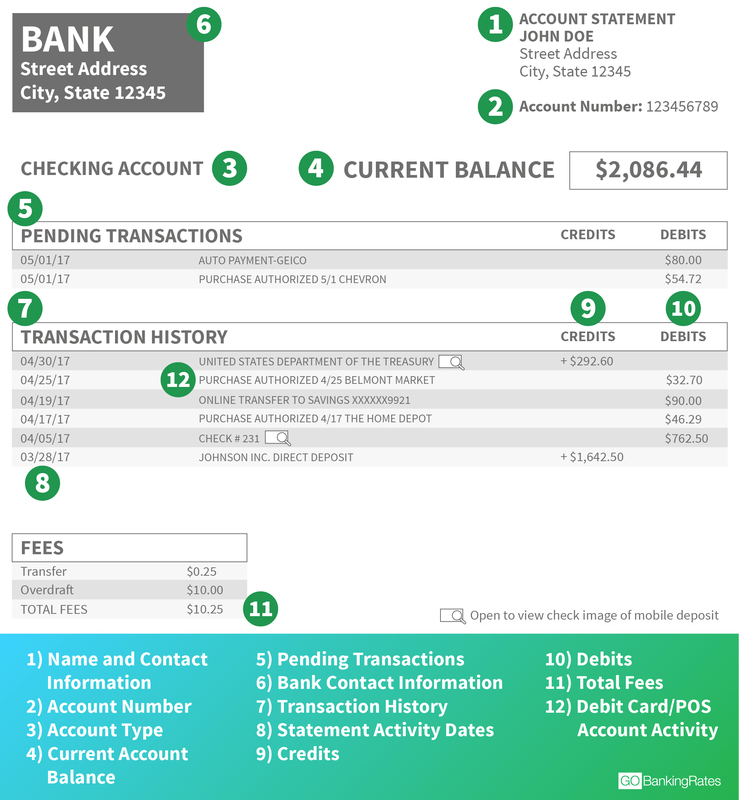 If you’re wondering, “What does a bank statement look like?” check out the example below to see the things that might appear on your statement summary, and what each one means. Your name and contact information: Data that identifies you typically appears at the top corner or center of your statement. Make sure the information is correct and that there are no misspellings. If you find an error, contact your banking institution. Account number: A long number that identifies your account, the account number is located at the top of your statement. It’s different from your bank’s routing number, which is a nine-digit number that identifies your bank. You can find your routing number on the bottom left of your check or online, and use it for electronic transfers and other transactions. Account type: This information shows whether you have a checking or savings account. Current account balance: The total amount of money in your account appears under this heading. Your available balance is all your funds immediately available for cash withdrawal — this number takes into account all pending transactions. Pending transactions: All transactions that are still pending are listed here. Bank contact information: This includes the name, address and phone number of your financial institution. Transaction history: All of the transactions you’ve made during the statement period appear here, including deposits and withdrawals. Transaction date: This shows the date the transaction was processed. Credits: This shows all credits or deposits you made to the account. Debits: This shows all debits or withdrawals you made during the statement period. Total fees: This shows all fees you accrued, including account, transfer and overdraft charges. Debit card/POS account activity: The date and description of all your debit or point-of-sale transactions are listed here. If your account is a savings account or interest-bearing checking account, you might also see a section for interest accrued. In addition, you’ll typically see a statement date at the top of the document. Why Should You Review Your Bank Statement? Reviewing your monthly statement is crucial because it helps you become familiar with your finances so that you can catch errors or problems right away, as well as find ways to improve your finances. Your bank’s liability for fraudulent charges might be limited to 60 days; if you don’t report fraud or dispute a charge within that time frame, you could be liable for the charges so it’s critical you review your statements regularly. Add up all of your ATM fees or other expenses, such as dining out, to be aware of your spending habits. If your statement doesn’t align with your budget, then you have a clear idea of how to improve the way you manage your money. Checking your statements can help you identify a financial issue before it triggers a negative balance and leads to expensive overdraft fees. Stay on top of your finances by being proactive about reviewing your bank statements. Information on bank statements varies among financial institutions. Your statement information might appear in a different order or format depending on the statement style your bank prefers. You also might notice differences in how the information is displayed on your paper statement versus your mobile banking app. If you’re unsure about a charge or activity on your statement, contact your bank’s customer service department or visit a branch office to get clarification. When choosing between receiving paper statements or accessing your statements online, have a clear understanding of the benefits of each. The benefit of e-statements is that you can access your monthly statements on your financial institution’s website or app, and perform a number of transactions at your convenience. With a daily barrage of emails being the norm, it can be tempting to just hit “delete” when a paperless statement notification lands in your inbox. Getting an actual paper statement makes it harder to ignore and can help ensure that you actually take the time to review what the statement says. How Long Do Banks Keep Your Statements? The federal Bank Secrecy Act requires banks to retain account statements for five years. Even if you close an account, you should still be able to access these statements for five years after the closing date.